We’re under attack! A giant space alien has invaded and is destroying the city. While the government is fighting back against the alien, the players are tasked with recovering as much jelly from the creature as possible so it can be studied. This is how a game of Attack of the Jelly Monster begins. Being a fan of all things sci-fi, I was really intrigued by Attack of the Jelly Monster. The theme initially sounds like something you would find in a movie or video game but I was intrigued in seeing how well it would translate to a board game. Being a fan of both speed and dice games didn’t hurt either. Attack of the Jelly Monster is not perfect but it does a good job creating an exciting and fun speed dice game. Create the city center. The city center is formed using the circular pieces. For three player games just use the smallest piece. Four player games add the medium sized piece to the small piece. 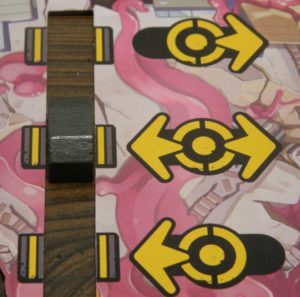 Five player games use all three pieces. Randomly choose one district board to add to each connector coming off the city center. Either side of the district board can be placed face up. For your first game it is recommended that you use the side with the green lights in the corners. Place the drone between two districts with the arrow pointing to the district on the right. Place the round marker inside the drone and have it point towards the one to indicate it is the first round. Add a target marker to the track on each district board. The marker should be on the space furthest from the center. Mix up all of the jelly-pods and form a facedown stack in the middle of the gameboard. Place the sand timer next to the stack of jelly-pods. Each player chooses a color. They will take the screen and all of the dice that match the color they chose. Sort the jelly tokens by their value and set them off to the side. Each player will be given two one-point jelly tokens. Attack of the Jelly Monster is played over four rounds. 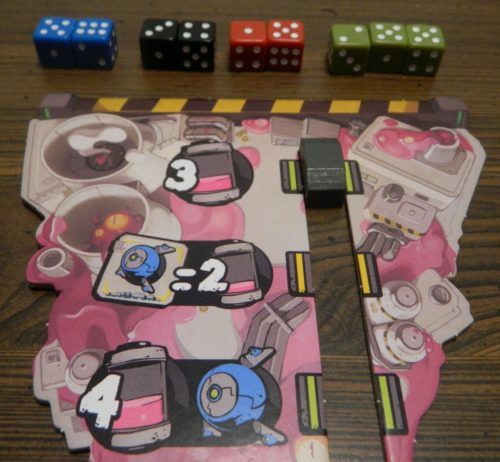 All of the players will play at the same time and can roll/play their dice as quickly as they want. Each round begins with the oldest player counting down. All of the players will roll their dice inside their screen. They can choose one of the dice they rolled and place it in one of the district entrances (at the end of the district they chose). Once a die is placed it cannot be moved to another district. If a player places two dice with the same number on the same district, the two numbers will cancel out each other during scoring. If the player doesn’t like any of their dice, they can choose not to place any of them. 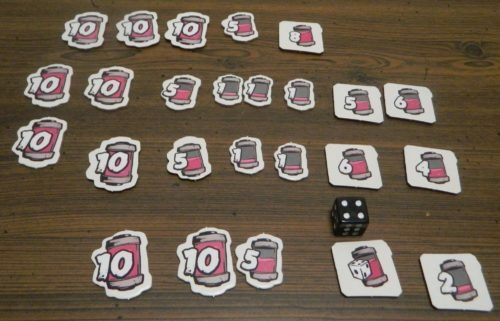 After a player has played one of their dice or chosen not to place any of them, the player rolls all of their remaining dice. The blue player has rolled their dice. They can choose to add one of their dice to one of the districts. They will then re-roll the rest of the dice. 1 or 2: The player who places the die may move any other die in the same district to the city center (center of board). 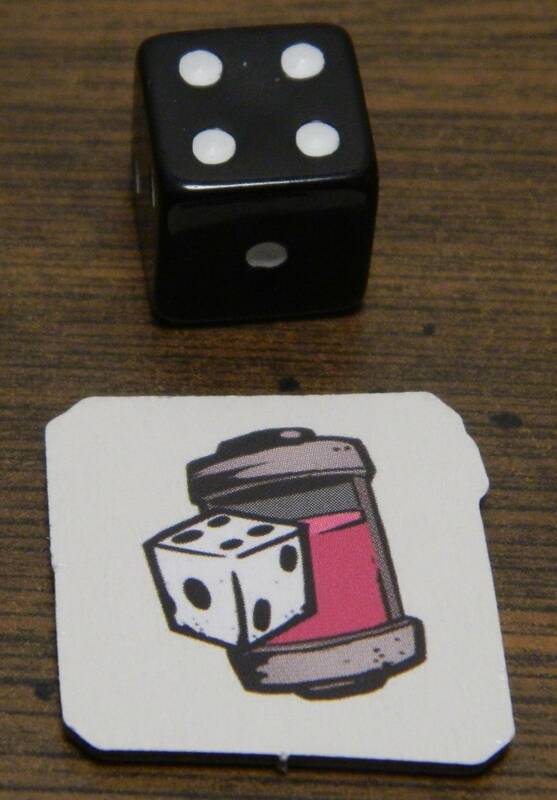 This die can be your own or another player’s die. The red player has played a one die in the district. They can remove one of the other dice from this district and add it to the city center. 3 or 4: The player who places the die can move the target marker for the district to an adjacent space. The marker can be moved one space towards or away from the center. The red player had played a three die in this district in the past and they moved the district’s marker. The green player played a four so they could choose to either move the marker up or down a space. 5 or 6: These dice have no special abilities outside of their value during scoring. This player added a six die to the district. This will count as six towards the player’s district total. 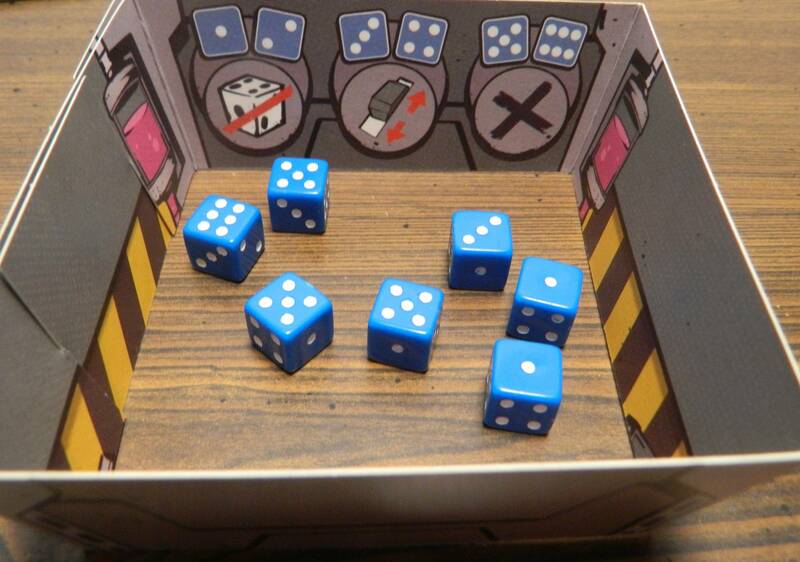 After a player has played all of their dice, they can lock down one of the districts. To lock down a district they place their screen over the dice placed in that district. Players can no longer add dice to this district. The player who played all of their dice can then flip over the timer. The rest of the players have ten seconds in order to play the rest of their dice. When the timer runs out, all players must stop placing dice. The blue player has locked down this district. When the sand timer runs out of time the game moves into a scoring phase. Any players who used their screen to lock down a district takes their screen back. All dice that weren’t placed are not scored at all. Scoring is conducted one district at a time starting with the district that the drone points to and proceeding clockwise. If a player has played two dice of the same number to a district, both dice are removed from the district and returned to the player’s screen. Players then total the numbers on their dice in the district. The player with the highest total wins the district. This player will take the reward next to the marker in the district. If two or more players tied for the lead, all of the tied players get the reward. For a description of what each reward means, see the “Rewards” section below. The scoring for this district is as follows: blue 11 points, black 7 points, red 6 points, and green 2 points (the two fives cancel each other out). The blue player has the most points so they will receive three jelly. After all of the districts have been scored, the players will score the city center. Players count up how many dice they have in the city center (the numbers on the dice don’t matter). The player with the most dice in the city center takes the top jelly-pod token. They can look at the token but should keep it facedown so the other players can’t see it. If there is a tie, all of the tied players get to take a jelly-pod token. At the end of the round the black player had three dice discarded, two green dice were discarded, and one blue and red dice were discarded. 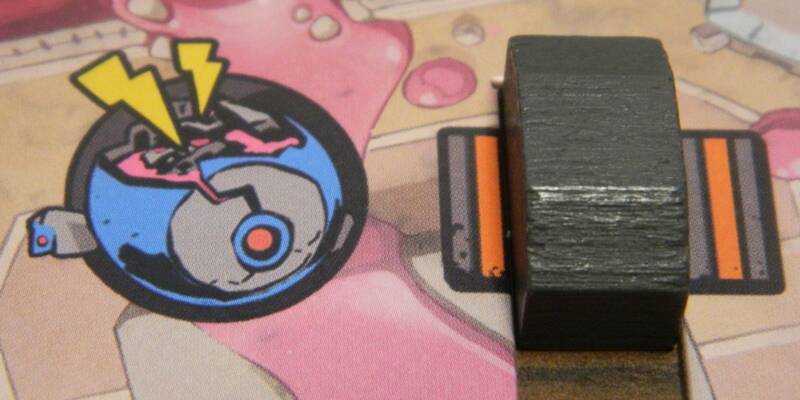 The black player had the most dice discarded so they will get to take the top jelly-pod token from the board. After scoring is completed, the game is set up for the next round. Each player takes back their seven dice. The city center and the drone are rotated 90 degrees so each player faces a different district. All of the target markers are returned to the spaces furthest from the center. The round marker is advanced one space. The player who wins this district will receive seven jelly. At the end of the game the player will roll one dice for each of these symbols they control. The black player rolled a four for this token. The token will be worth four points. The player who wins this district will receive the top jelly-pod token from the city center. 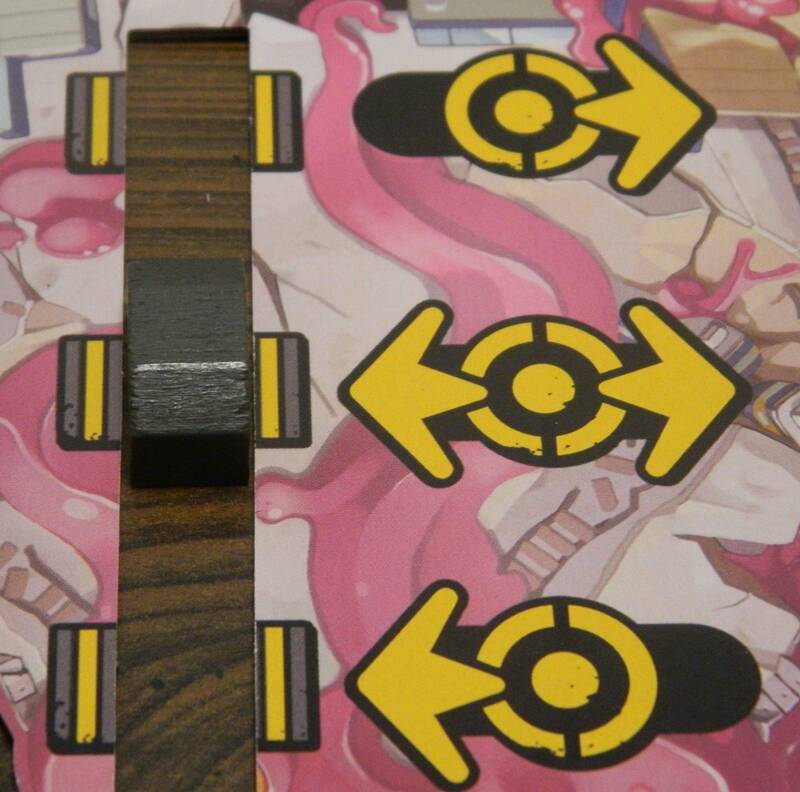 The player who wins this district will have to discard (return to the box) one of their jelly-pod tokens. The player will get to choose which jelly-pod token they would like to discard. The player who wins this district will receive two jelly for each jelly-pod they control. If the marker is on the top symbol the winner of the district would get the reward from the district on the right. The middle symbol will let the winner choose if they want the reward on the left or right. If two players tie for the reward, both have to agree on which reward they would like. If they disagree it is treated as an arrow pointing to the left. The bottom symbol will give the winner of the district the reward on the left. All of the other players will have to give the winner of this district a number of jelly equal to the number (one in this case). The winner of this district will have to give one jelly to every other player. The reward the winner receives depends on how many dice they placed in the district. If the winner of this district only had to use one or two dice they will receive seven jelly. If they used three or more dice they will receive a Jelly-pod. If there are multiple rewards, the player who wins the district gets the first reward. The player with the second highest total gets the second reward and so on. Tied players share their reward and the player with the next highest total get the next reward. The player with the highest total in this district will earn three jelly. The player with the second highest total will receive six jelly. The game ends after the fourth round. Each player counts up their final score by adding up their jelly tokens and their jelly-pods. The player with the most points wins the game. If there is a tie, all tied players share the victory. The top player scored 43 points, the second player scored 39 points, the third player scored 37 points, and the bottom player scored 31 points. The top player scored the most points so they have won the game. 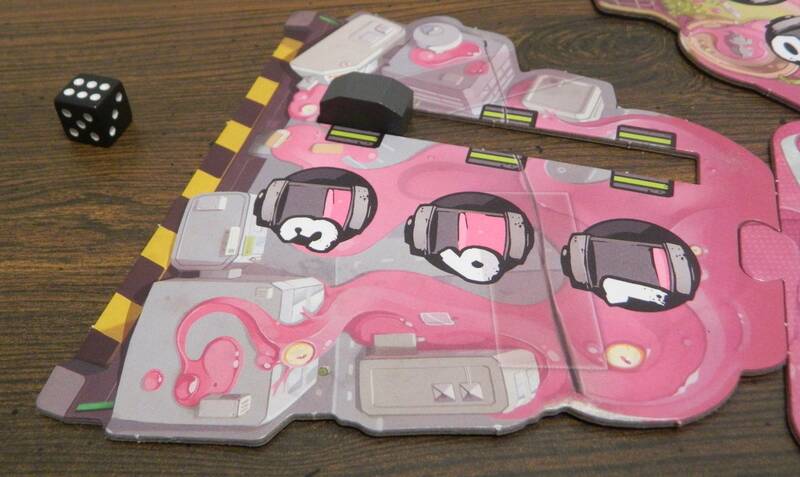 On its surface Attack of the Jelly Monster seems to be quite similar to your typical speed dice game. You have a limited amount of time to roll your dice. You have the ability to keep re-rolling your dice until you get a result that you like. All of the players roll at the same time and can keep rolling dice until one player gets rid of their last die. Speed is key as you have to roll the dice and figure out what you are going to do with them quickly. All of these mechanics are present in Attack of the Jelly Monster. While the basics are pretty similar, I also think Attack of the Jelly Monster does a pretty good job differentiating itself from your typical speed dice game. 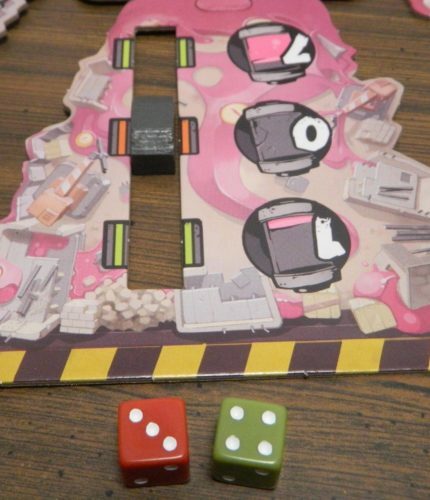 I think the reason that Attack of the Jelly Monster is unique is because it adds an area control mechanic to your typical speed dice game. Most speed dice games have you rolling dice as quickly as possible in order to get a better combination. That is not the case in Attack of the Jelly Monsters. Instead you are rolling dice and placing them around the gameboard in order to control different districts of the gameboard. Instead of comparing your dice to different combinations, you need to figure out how you can use your dice to take control of districts. This adds another dimension to the game as you have to focus on what you are rolling in addition to keeping track of who controls the different districts. As the player who has the highest value on a district controls it, with the play of just one die control over a district can change. What makes the area control mechanics really interesting is that each number has its own unique ability. In a lot of dice games some numbers are superior to others. That is not the case in Attack of the Jelly Monster as each dice has its own uses. Fives and sixes have no special abilities but they add the most to your total in the districts that they are placed. Next comes ones and twos. These dice don’t add much to a district’s total but they can eliminate a valuable dice from one of your competitors. A player might think they have total control over a district and the placement of one die can make them lose that advantage. Finally threes and fours can mess with players by changing the rewards that the winner will receive. If you control a district you probably want to move the marker towards the most valuable spot. If you aren’t going to win a district though you could play one die to make the reward worthless or even be a negative for the player who wins the district. This ability in particular is really interesting as it forces you to always keep track of all of the districts you are involved in. Another mechanic that I found really interesting is the idea that all duplicate dice in a district cancel each other out. Normally you would just keep playing five and six dice on the districts you want to win as they add more to your total. With this rule in place though you don’t want to ever play more than one of each number in a district as it ends up making both dice worthless. You would think it would be pretty easy to avoid playing two dice of the same number in a district. With players playing dice as quickly as possible though, you would be surprised by how often it happens. This mechanic forces players to slow down and analyze a district before placing a dice. On the topic of no dice being worthless in Attack of the Jelly Monster, the game even comes up with a way for players to possibly get points from dice removed by the other players. 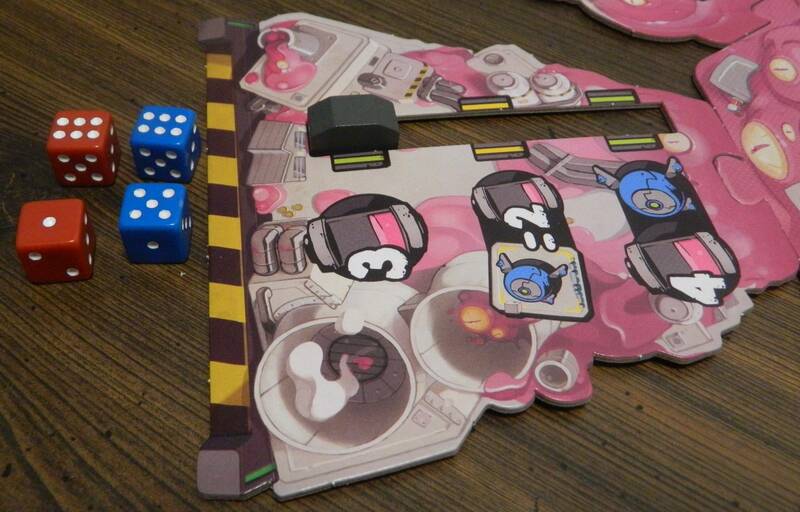 The player who has the most dice removed during a round gets the ability to take a jelly-pod token. This offsets some of negative impact if the players gang up on a player. I generally like the jelly-pod tokens as they add a little surprise to the game as no one knows how much each token is worth. The problem with the tokens is that their values can differ quite a bit. A player can get one token that is worth more than multiple tokens that another player has received. This adds quite a bit of luck to the game as you have no impact on which tokens you end up drawing. 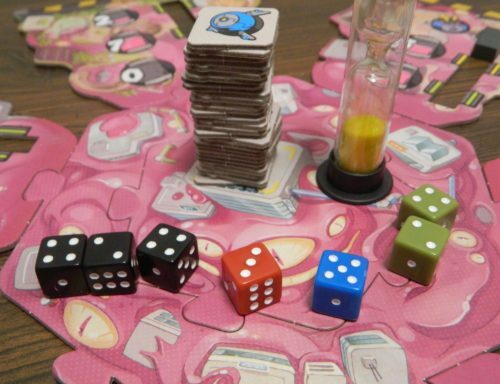 Attack of the Jelly Monster relies on a lot of luck like most dice games. There is more skill/strategy to the game than you would expect though. Outside of luck, two things will determine how well you will do in the game. The most obvious is how fast you are. The faster you can roll the dice the more opportunities you will have to roll the dice. What is more important is quickly determining what you want to do with your dice. You can only use up to one dice each time you roll the dice. You need to quickly choose which die you want to use and in which district you want to use it. If you ever fall too far behind the other players, you will end up not being able to use all of your dice which limits how many points you can score. While you are figuring out what to do with your dice, you need to keep track of all of the districts. The key to doing well in Attack of the Jelly Monster is to win districts by a small margin. You need to make your total large enough that you ultimately win the district. If you waste too many dice in one district though, it prevents you from competing in other districts. You need to try and maximize all of your dice. A district might not be worth a lot but if you only need to use one or two dice to take control of it, it might be worth pursuing. You want to win as many districts as possible but you also don’t want to give the other player’s easy wins. All of these mechanics lead to Attack of the Jelly Monster being a pretty fun game. People who like speed dice games should enjoy the game. It is fun rolling the dice and quickly figuring out how you want to use them. The game is quite accessible where the whole family should be able to enjoy it. The game can be a little hectic at times as you have to make decisions quickly. If you are the type of player who finds it stressful being forced to make decisions quickly, the game probably won’t be for you. I think most other people could get at least some enjoyment from the game though. While I enjoyed playing it, Attack of the Jelly Monster does have some issues. Some people might think this is a positive but I think games of Attack of the Jelly Monster end a little too quickly. I would say that most games will probably only take 10-15 minutes. If you are looking for a quick filler game, this is perfect. The problem is that I think the game feels a little rushed. I don’t think four rounds is enough for the game. The game feels like it ends as quickly as it begins. With only four rounds, if one player has a really good round there isn’t much time to catch up. I wouldn’t extend the game too long but I think a couple extra rounds would have improved the game. Next I think the game should have done something to add a little more variety to the districts. Once you choose the districts at the beginning of the game, you are stuck with those districts for the rest of the game. As you use the same districts each round, players tend to go after the same districts each round. I think the game could have benefited from changing out the districts at some point. For example just flipping over the districts at the mid-point would add quite a bit more variety to the game. This would force players to go after different districts instead of doing the same thing each round. The final potential issue with the game is that there is the potential for players to cheat quite easily. In a game like Attack of the Jelly Monster, each player is basically responsible for themselves. There is not enough time to monitor the other players while playing the game yourself. If another player wanted to cheat, it wouldn’t be that difficult. The players need to play honestly and not break any of the rules or the game will be ruined. Unless one player sits out the game to act as the referee, there is no way to really know if another player is cheating. As long as everyone follows the rules this shouldn’t be a problem. Some players are going to cheat though to get an advantage in the game. Before wrapping up I wanted to quickly talk about the game’s components. There are things that I liked and other things that I think could have been better. On the positive side I really like the game’s artwork. The artwork is really good and does a good job supporting the game’s theme. The components themselves are solid but could have been better. The game mostly uses cardboard which is not bad but is a little thin. The biggest problem is that I think the game could have used full sized dice instead of the mini dice that the game includes. Should You Buy Attack of the Jelly Monster? 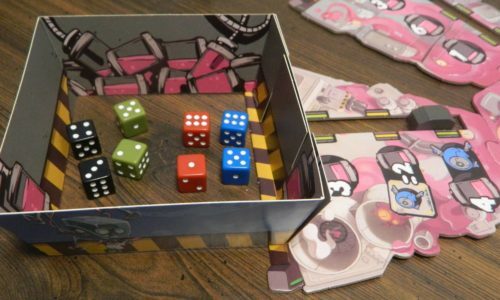 Attack of the Jelly Monster has a lot in common with your typical speed dice game while adding in an area control mechanic. This adds quite a bit of decision making to your typical speed game. Every number you roll in the game gives you a special ability. You need to roll your dice and quickly decide which die to use and where to place it. You need to take advantage of the special abilities to help yourself and hurt the other players. The ultimate goal is to control as many districts as possible in order to score more points. The special abilities of the dice require you to always keep track of what is going on in each district. While this can be a little hectic, it is a fun game. I wish the districts would occasionally be changed out though. I also think the game is on the short side and it is pretty easy to cheat. 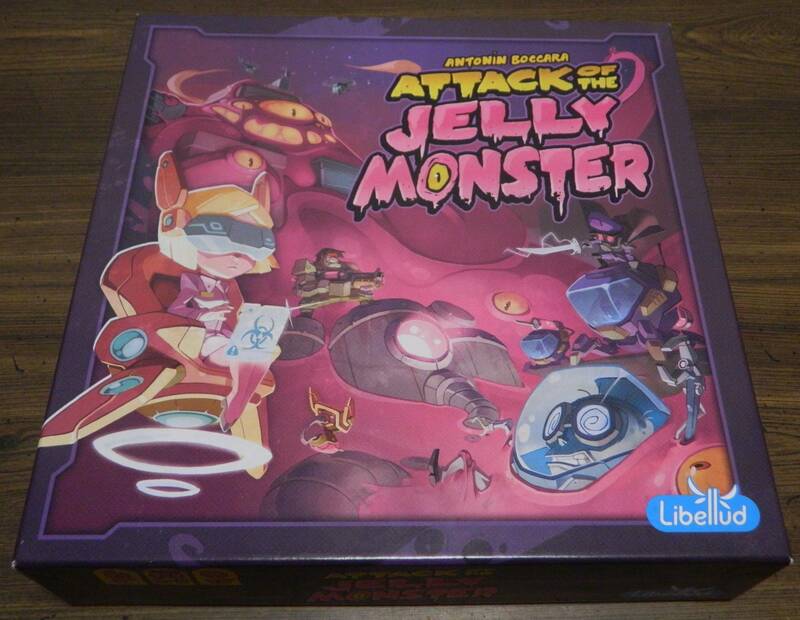 If you don’t really care for speed or dice games, I don’t think you will like Attack of the Jelly Monster. 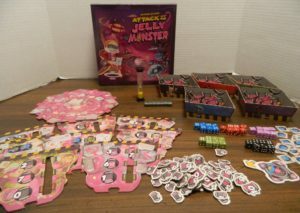 If you already own a similar dice game, I don’t know if Attack of the Jelly Monster is unique enough to warrant a purchase. People who really like speed dice games and like the premise should enjoy their time with the game. I would recommend you pick up Attack of the Jelly Monster. Adds some interesting mechanics to a typical speed dice rolling game. A fun experience as you try to quickly figure out what you want to do with your dice. Using the same districts each round gets a little repetitive. The game ends a little too quickly.